Grand Mondial effectively uses Microgaming software to provide a complete gaming experience to their customers no matter what you might be looking for. You’ve got a massive number of exciting slots and every variation imaginable of traditional table games. The casino is a bit short on bonuses, but that’s no reason to give up on some of the best game play around. Grand Mondial casino is another casino production running on Microgaming software that provides professional services and quality gaming. Thanks to Micrograming, Grand Mondial casino is home to a wide range of different styles of games leaving almost no gaming stone unturned for their loyal customers. 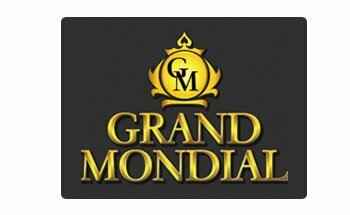 Grand Mondial casino is run by Micrograming meaning that they have a huge number of casino games of all different styles. From simpler games with old-style graphics, to Marvel slot machines and the best in visual and audio technology, Microgaming truly offers it all. Thank goodness the Grand Mondial casino lobby is well organized or you’d easily get lost between all your gaming options. With over 500 slot machines alone, Grand Mondial is the place to be if you’re looking for lots of choice. With over 500 slot machines alone, Grand Mondial is the place to be if you’re looking for lots of choice. Besides slot machines Grand Mondial casino games include 43 versions of Black Jack, 60 version of video poker and a multitude more of famous table games and arcade type experiences. Microgaming also shows their diversity in Grand Mondial casino by offering different levels of quality in graphics and audio. On the downside, there is currently only one regular Grand Mondial casino bonus which is a welcome bonus that you only have a gambler’s chance at getting. You’re given exactly 1 hour on the clock and $2500. If you win $100 by the end of that hour, then that’s you’re welcome bonus. Noobs may not know it, but $2500 is a lot to lose in 1 hour of playing, so you’re almost guaranteed that $100. 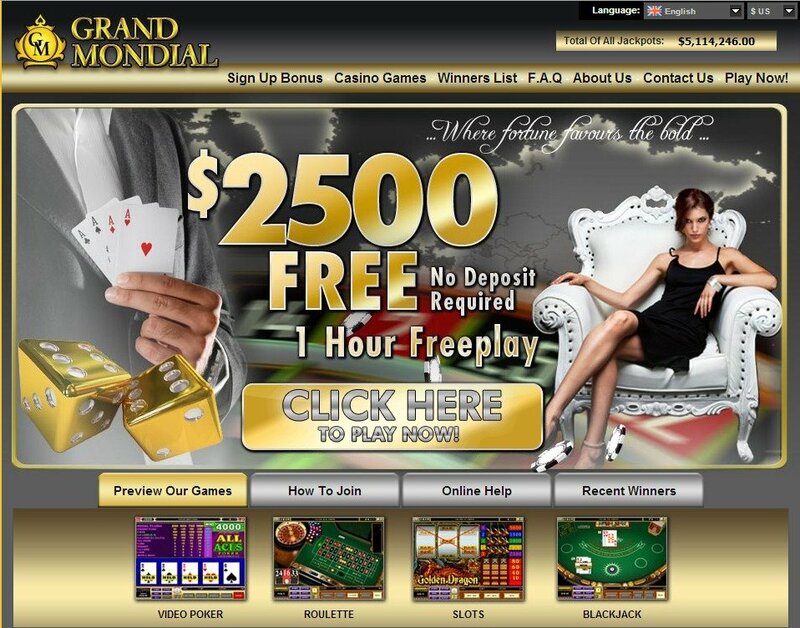 Grand Mondial casino also offers a healthy number of payment options catering to a wide audience of customers. Perhaps Grand Mondial’s biggest banking faults are that information about their banking system isn’t very easy to find until you actually go to make a deposit. I always feel more comfortable depositing at an online casino when I know and understand exactly what and how I’m going to deposit. Customer support at Grand Mondial casino is just about as good as it gets. There’s an international toll free number as well as toll free numbers for Canada, the UK, Denmark, and Germany. 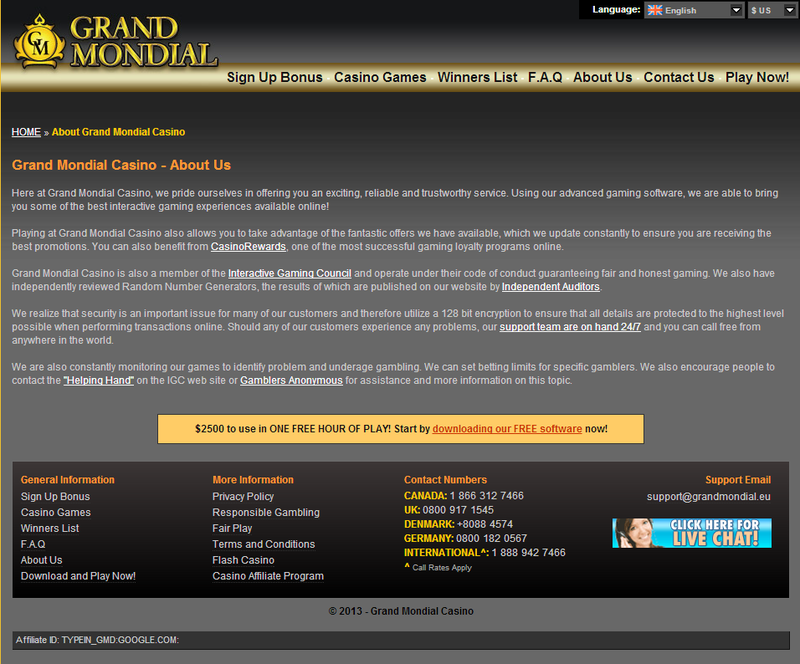 Grand Mondial can also be contacted by email or Live Chat 24/7.